The most import thing in a business is your customer database. Yet surprisingly few businesses have one centralised database of customers and contacts for use throughout the entire company. 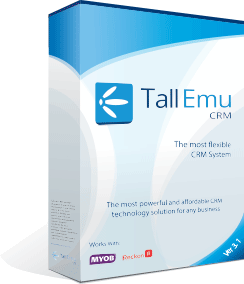 Tall Emu CRM stores all contact and company information as well as all the important activities with your customers. What does your company look like? Most companies already have an informal way of managing their customers, with each individual working out a way that works for them. Some people prefer to use outlook, others have word documents, or excel spreadsheets, or even keep customer details on paper until it’s time to put them into the accounting systems! Data not stored in a centralised, sensible database cannot be used to help your business succeed! Tall Emu CRM solves this problem by storing all company and contact information in one central database, where it can be managed, shared and used. Pull in your existing data. Our document management system allows important documents such as marketing materials, policies, procedures and price lists to be centrally stored and managed. In day to day business you deal with individuals (contacts) who may work within an company. The details of each contact are recorded, and optionally linked to a company. This allows you to easily see all of your interactions with specific individuals, but also, if they’re linked to a company, you can step up a level and see all of your interactions with everyone in that business. When a customer or prospect calls, can you easily find out who was the last of your staff to deal with them, what it was about, what issues they have faced – you get a full view of everything that’s gone on with the customer and who within your company the activity was with. The data isn’t only useful when a customer calls you. It can also be searched and used to form the basis of powerful marketing campaigns, such as â€œFind all the customers that we haven’t called in 2 months, which have purchased from us twice or more before.